The Half Moon Theatre has been a hidden treasure. Based in Tower Hamlets, it constantly produces and puts on some of the best theatre for young audiences, and engages with local young people through inspiring projects like Dramatic Maths. And in recent times it has literally been hidden, behind a wall of scaffolding and building work, making it difficult to spot. Just in time for spring, the extensive refurbishment which has kept this top children’s theatre under wraps is gradually wrapping up, revealing a stunning exterior underneath. The renovated building itself is fairly historic – a foundation stone dating back to 11th July 1862 reveals it is over 150 years old. Originally Limehouse District Board of Works Offices, it went on to become the Public Health Department of the Borough of Stepney and was noted for its “dignified style”. The Half Moon Theatre moved into the building in 1994. This hasn’t only been a renovation and refurbishment – there has also been an addition, of a brand new roof sign. 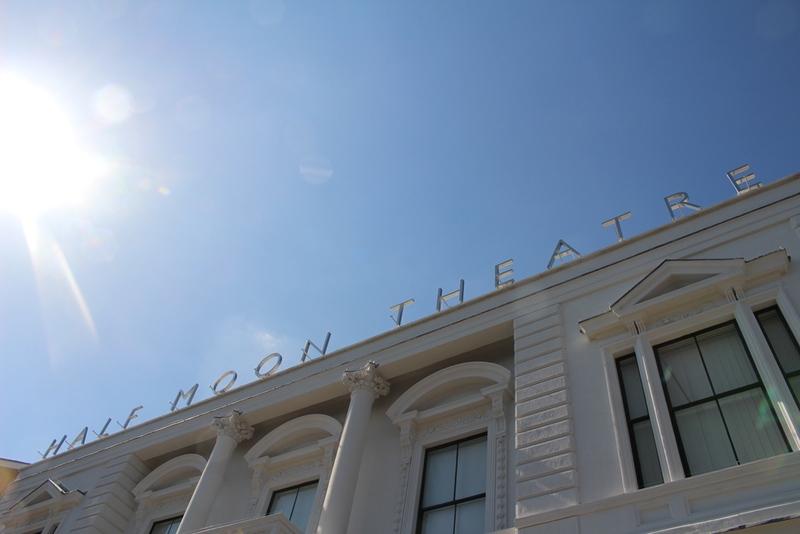 The past couple of years have seen many exciting changes for the Half Moon Theatre. A gallery space opened up in 2012 for local artists to display their work, available for children and young people to view for free. The gallery has chalk boards for visitors to draw or write their responses, and an art trail. The current exhibition is Ritual by John Mason, which will be shown until 24th June. It will be replaced with In the Minds @LPS by students of Langdon Park School until 1st September.